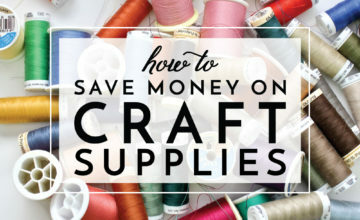 Quite often, I post my holiday crafts or gift ideas very close to the actual holiday; and they almost always include a line that says something like “I promise these are really quick to pull together and use only things you have around the house, and you can get them done by tomorrow.” Well, unless you’re a super last-minute crafter like me AND have a craft stash like mine, you’re probably not using my great holiday gift idea at the 11th hour. Sorry about that. 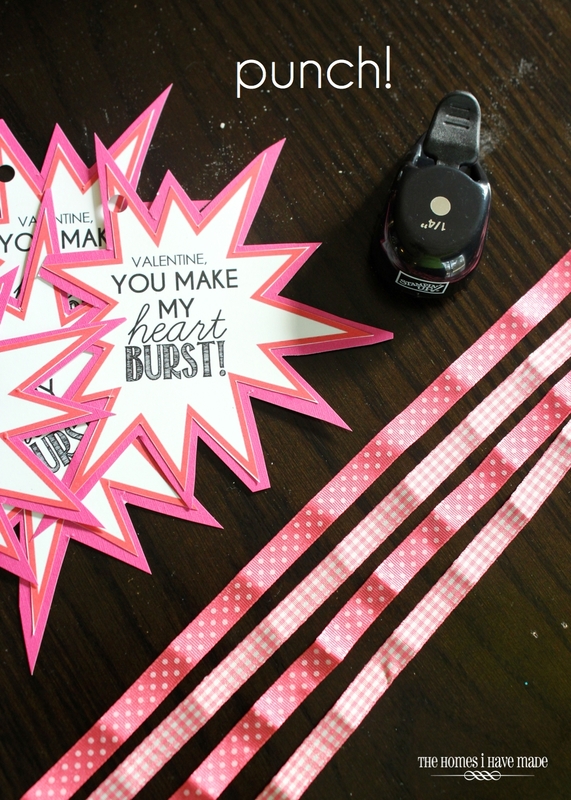 Well, this time around, I’ve got my son’s teacher gifts done in plenty of time for you to do them too! 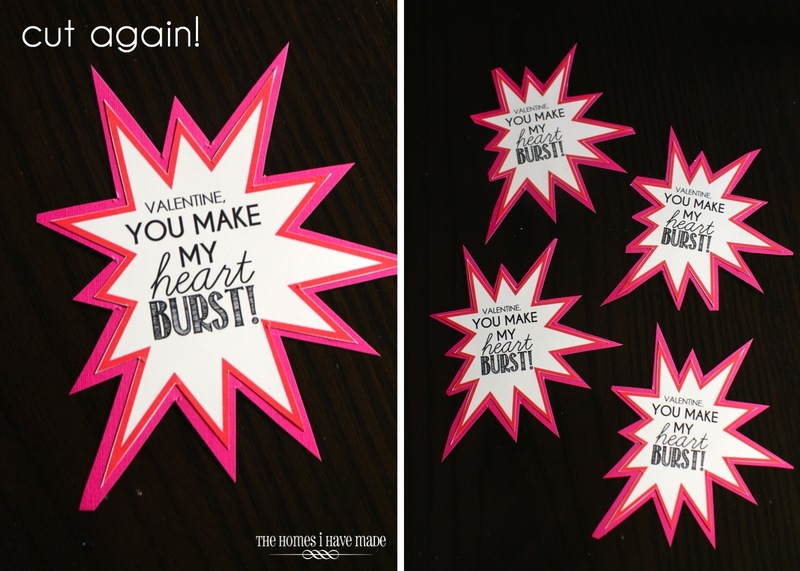 Valentine’s Day is 4 days away – so if you need an idea for a neighbor, teacher or co-worker, you have plenty of time to get these babies done! I certainly can’t take all the credit for this one. 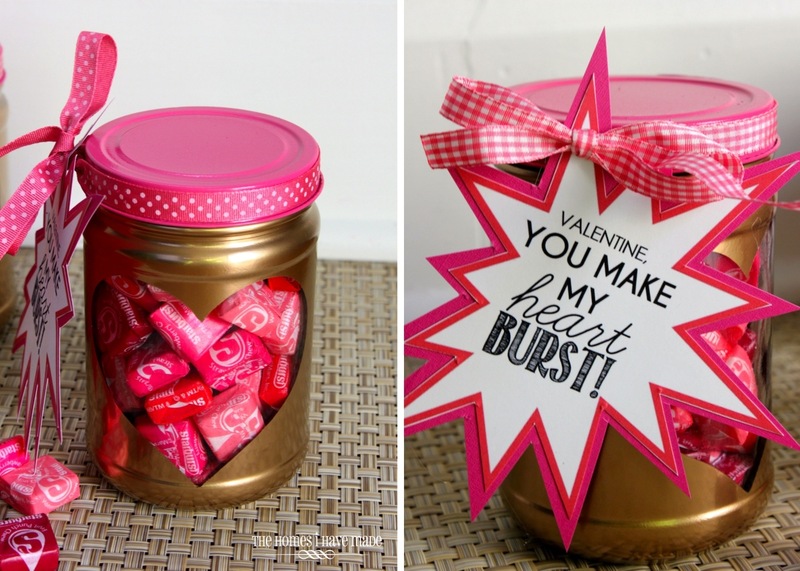 Food- and toy-related Valentine’s Day puns are all over the web; and I got this cute painted heart window idea HERE. Still, these turned out too darling not to share, don’t you think? I’ve been known to use old condiment jars for gifts in the past. (You can see my similar Halloween ones HERE). I don’t keep all our glass jars, just certain ones because of their shape or size. 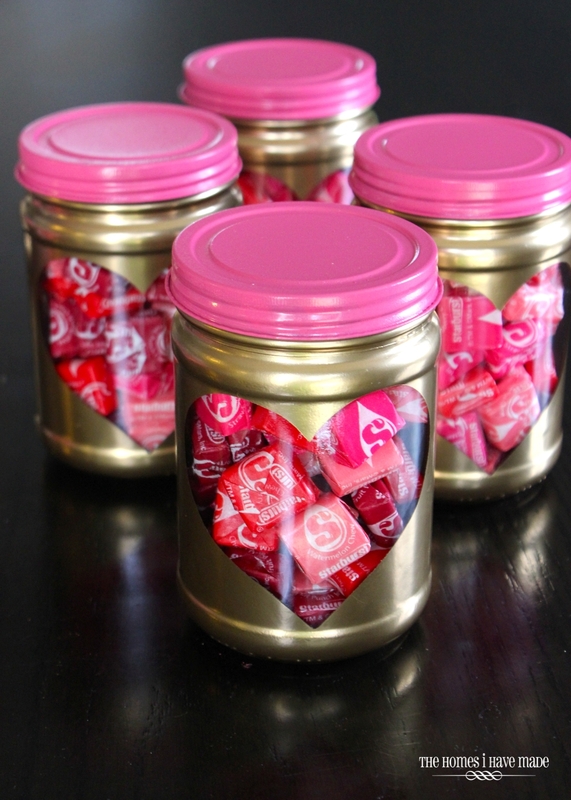 I love these peanut butter jars because they are a great size for holding treats (not too big and not too small), and are perfect cylinders, which make for easy decorating! A soak in hot, soapy water takes the labels right off with some scrubbing. 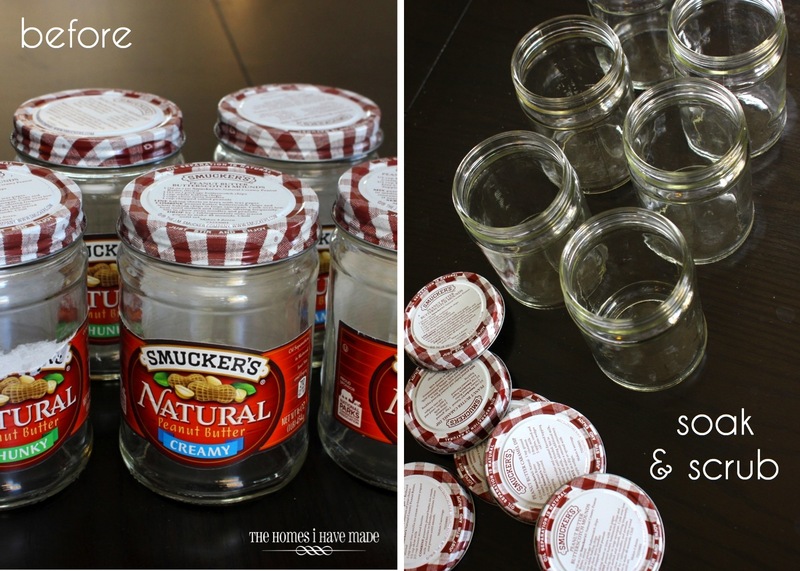 I also ran these jars through the dishwasher to disinfect them and remove all traces of peanuts, just in case there are any allergies. 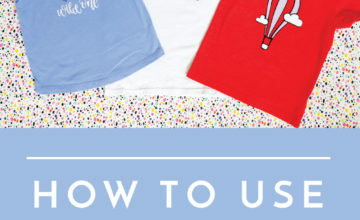 Creating the little heart peek-a-boo window is pretty simple. 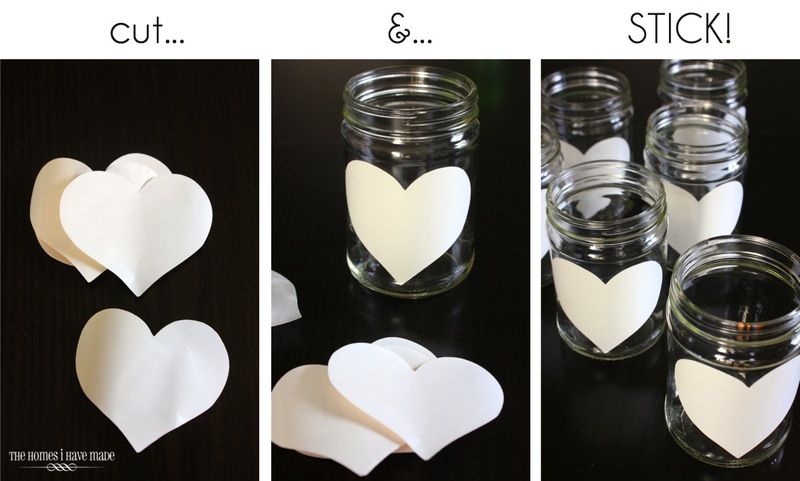 I cut a bunch of 3″ tall hearts from white contact paper using my Cricut. I then applied them to the fronts of the clean and dry jars. 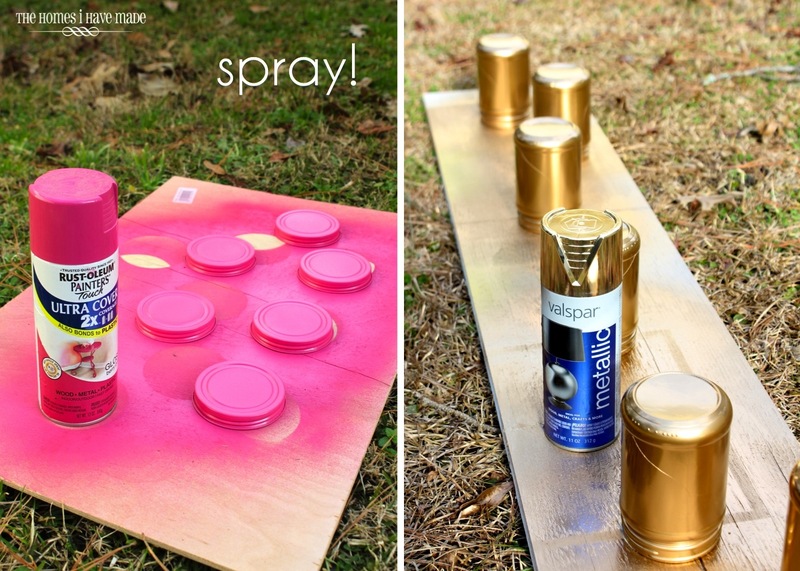 The trickiest part of this whole project was waiting for a warm enough day to give them a quick spray – the lids got pink while the jars were given a hefty dose of metallic gold. Typically, it’s best to remove any tape or decal while the paint is wet to get nice clean lines. 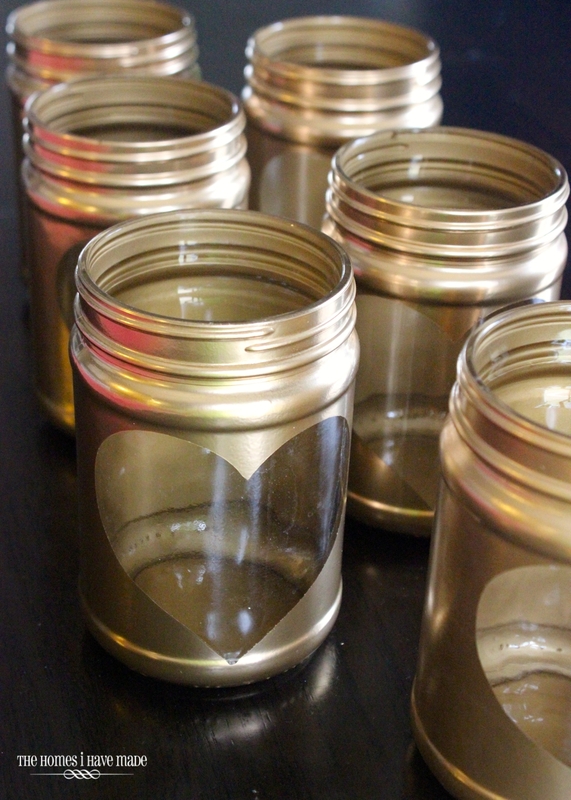 These jars are a bit tricky to handle when wet, so I waited for them to fully dry before removing the paper heart. Thankfully, I had clean lines all the way around! 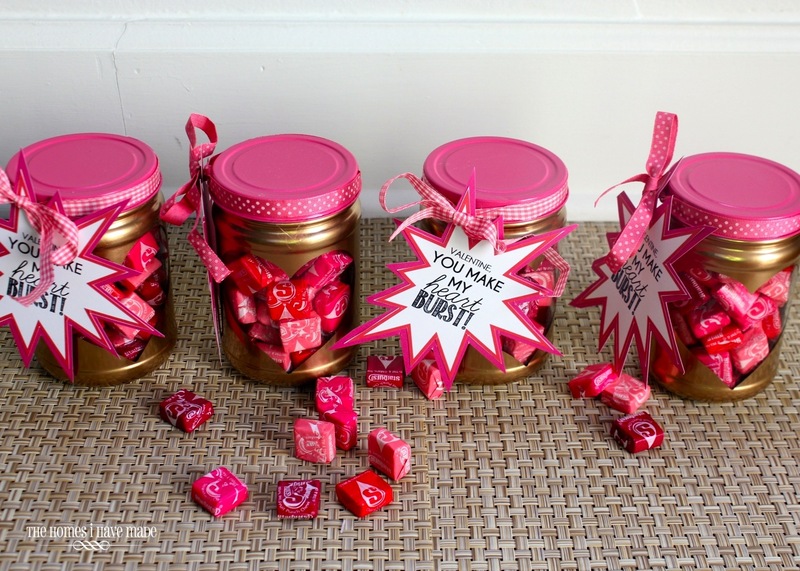 Next – fill up the jars with candy and close the lids! 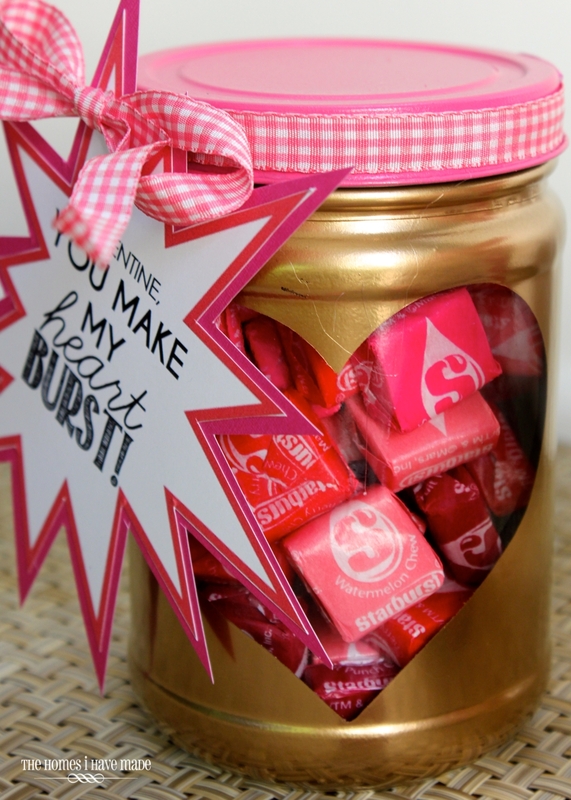 Remember when I bought the Starburst at Target? Told you I had a plan for them!!! 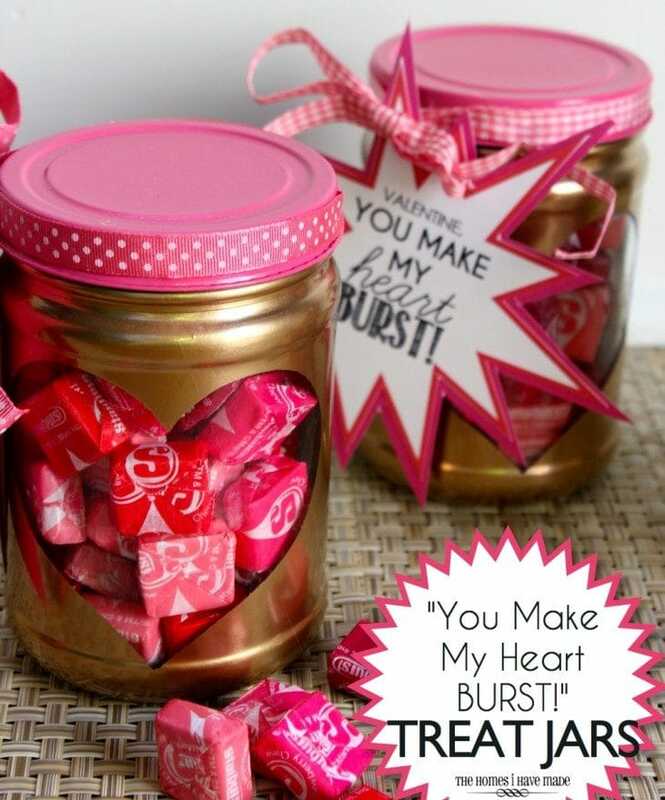 I wanted to make some quick labels to decorate the jar and enhance my “burst” theme! I made these little labels with just a piece of clipart and some fonts on the computer. 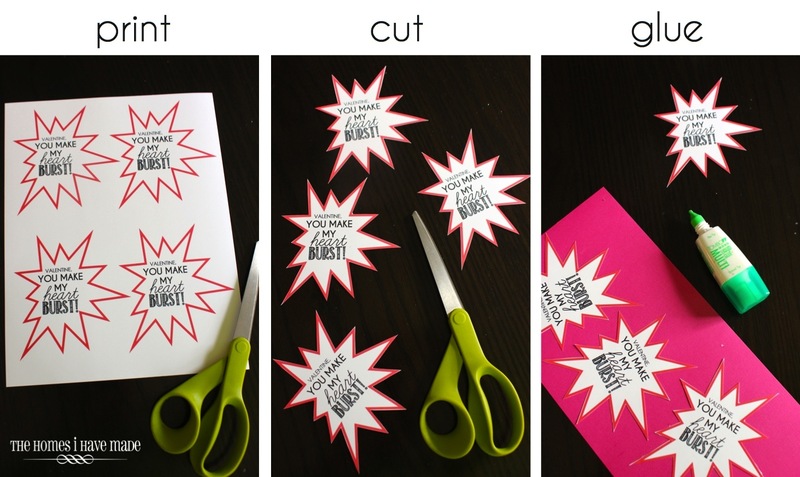 I printed the labels on white cardstock and then cut them out with scissors. I wanted a bit more color and bulk, so I glued them to some hot pink cardstock and cut them out again, leaving a border as I went. 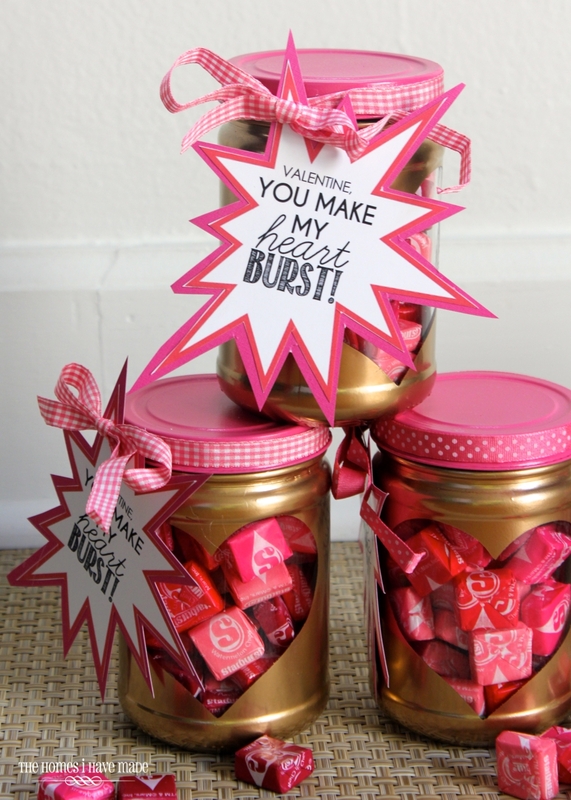 Before adding them to the jars, each one got a quick hole punch. I also dug through my ribbon collection to find some coordinating ribbon. Sometimes when I tie labels on to bags, boxes or jars, they get a little twisted or pinched. 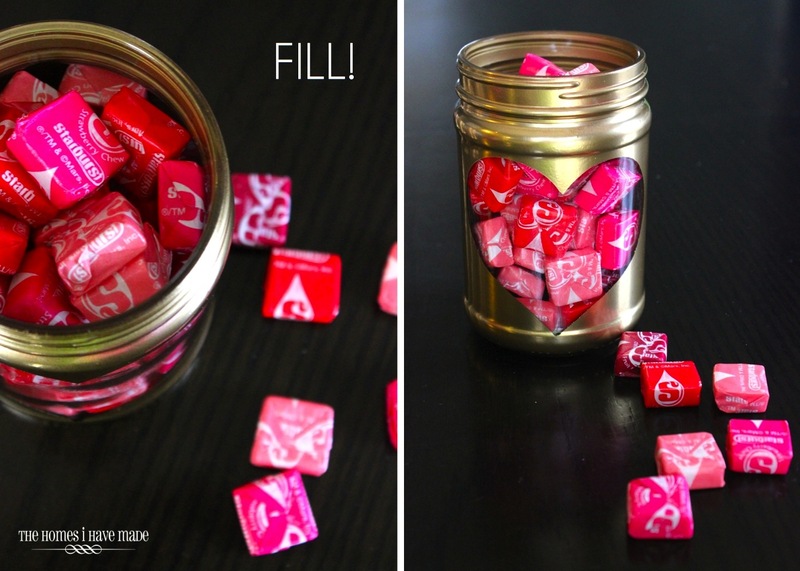 I came up with a great method for adding a tag to a jar! First, I hot glued my ribbon around the edge of the lid (this allows the lid to be opened without untying the label). 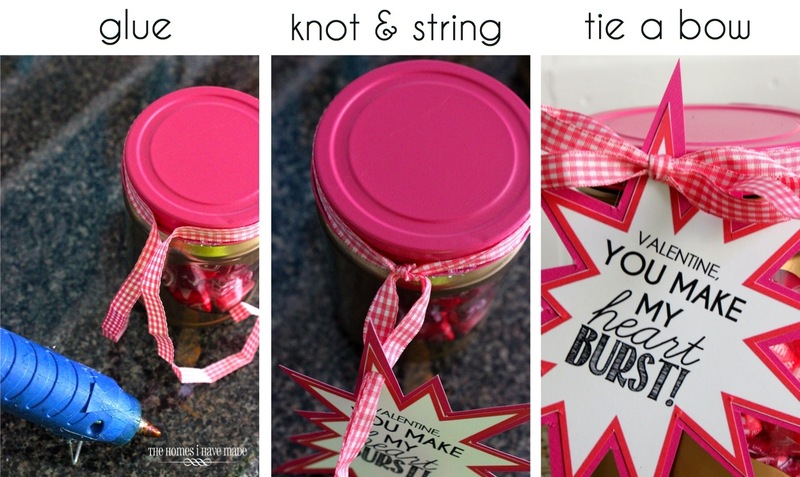 Next, I pulled taught and tied a simple knot in the ribbon alongside the lid. Then I pulled both ends of the ribbon THROUGH the whole on my tag. With both ends on the front of the tag, I tied a simple bow to keep it in place! These were really fun and not at all hard to make. 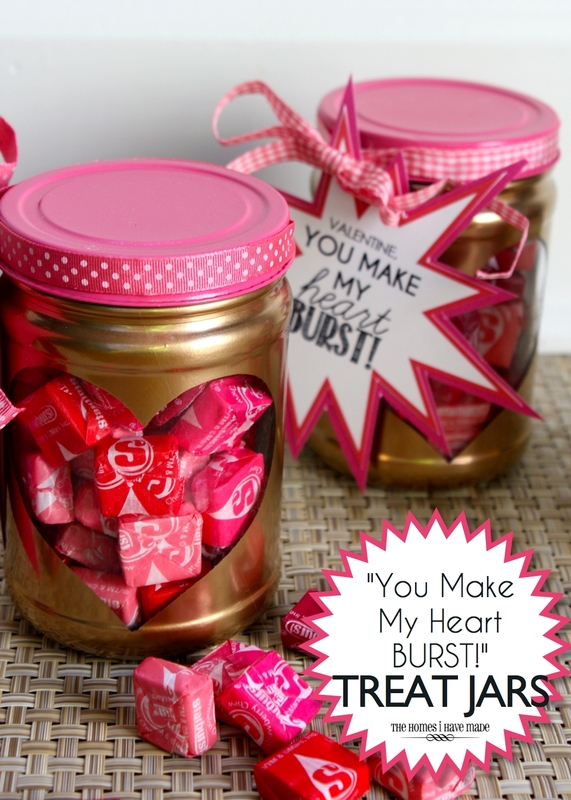 I had everything but the Starbursts in my house; but even if you didn’t, these wouldn’t cost too much to make in bulk! Pretty cute little gift, huh? 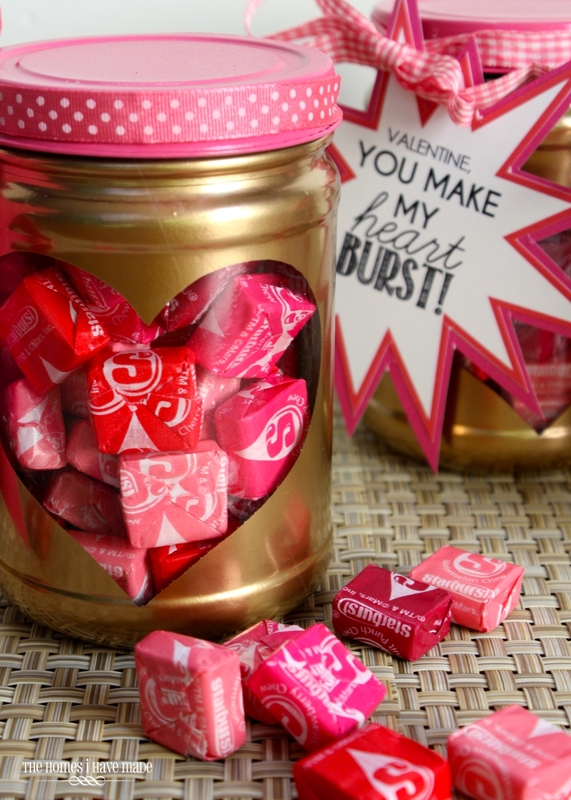 Amazing what a little paint, paper and ribbon can do to a plain ol’ peanut butter jar!